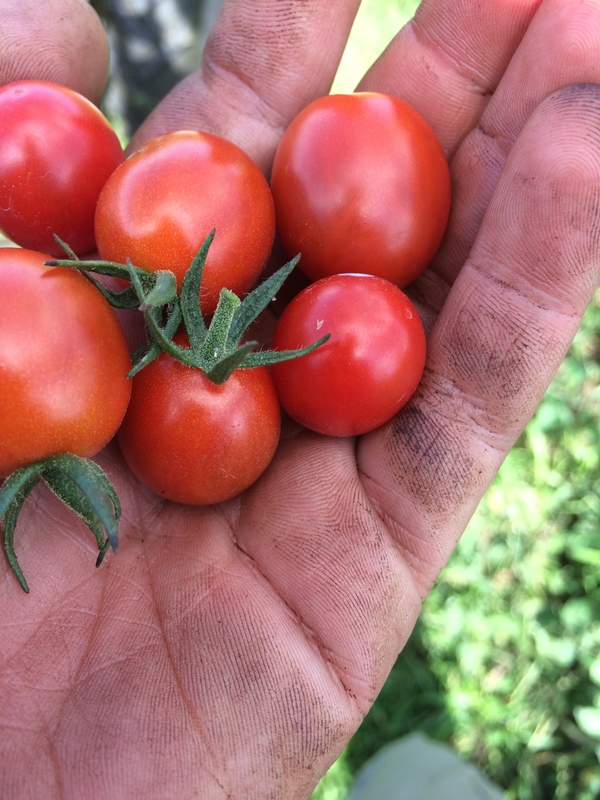 The tomatoes are in full swing and with this summer heat they are producing like crazy. Last week we had our first harvest and most of them were surprisingly spot free. The chefs are super excited and everyone is fighting over processing the seconds…. which is absolutely fantastic, although I am hoping most of the crop will be beautiful 1sts!! 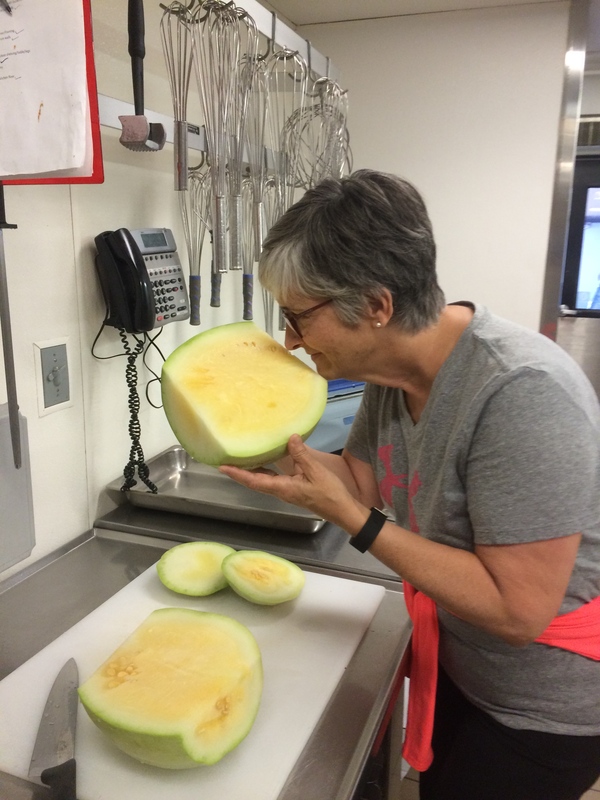 Not only did we have our first harvest of tomatoes last week but we also had our first harvest of watermelon as well. These were just on the cusp of being ready. I brought some in for my boss, Sue, to try. They were right on the verge of being ready so I am super pumped to see what this week brings. I counted them today and we should have approximately 25 for sale this week. The squash have really surprised me this year. 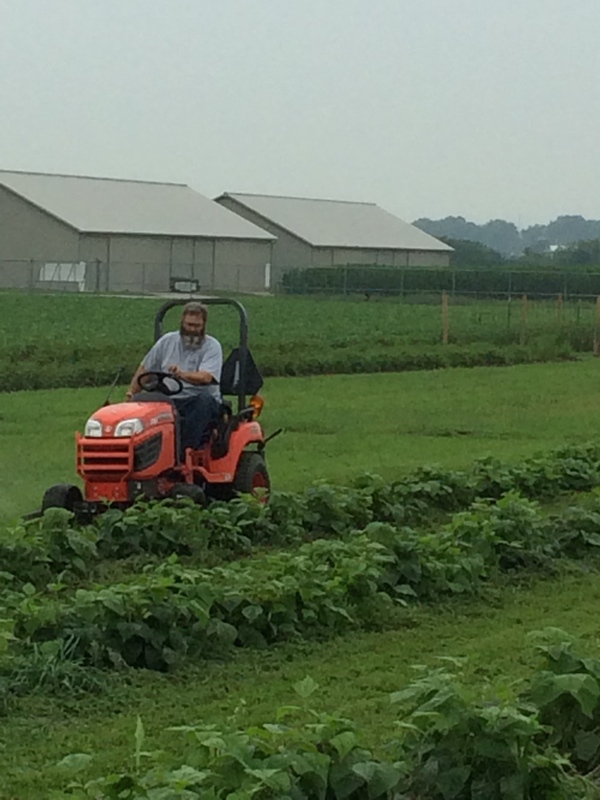 We are continuously harvesting up 400# a week of two 180ft beds. Every week I keep thinking it will be the last but they keep producing. This week will be no different. Although I am grateful for the bounty, it is really taking a toll on our hands. The thistles on the side of the squash scrape and cut our hands when we harvest. By the time Sarah and I are finished our hands are red, itchy and very swollen. This week we will be wearing iron worker’s gloves :). Sarah and I are working hard to get our fall crop out of the greenhouse and into the field. We planted beans, spinach and rainbow chard today. Next up will be the kale, broccoli, 2nd planting of romaine and parsnips! There is an intense heat advisory tomorrow and the next day so Sarah and I will be in search of a large pool/ swimming pond after work if anyone has one to lend for a couple hours :). Well well well, sunshine going on 14 days in a row! We actually had to use our irrigation for the first time other than fertilizing. It has also been hot so this is perfect for our tomatoes and peppers. 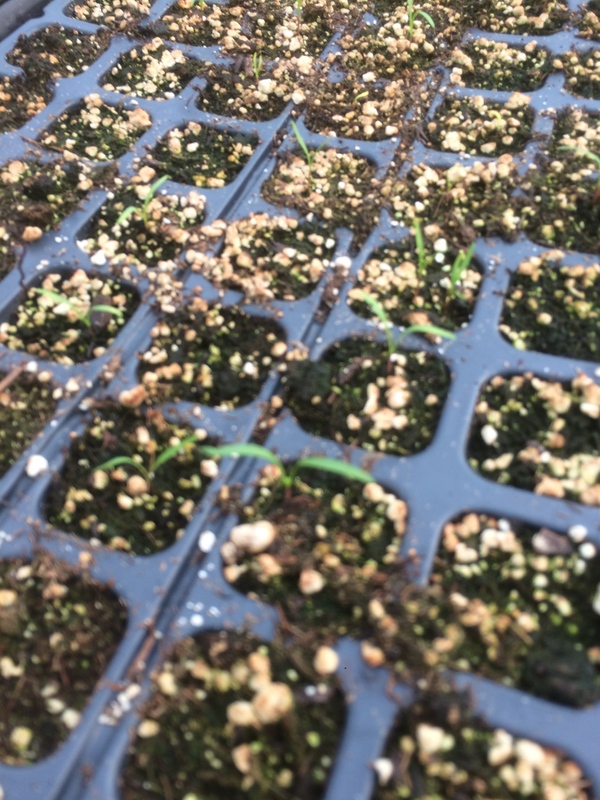 We saw our first signs of life from our cherry tomatoes last week. They are so plump, sweet and juicy. I’m trying not to eat all of them as I pass by the beds. 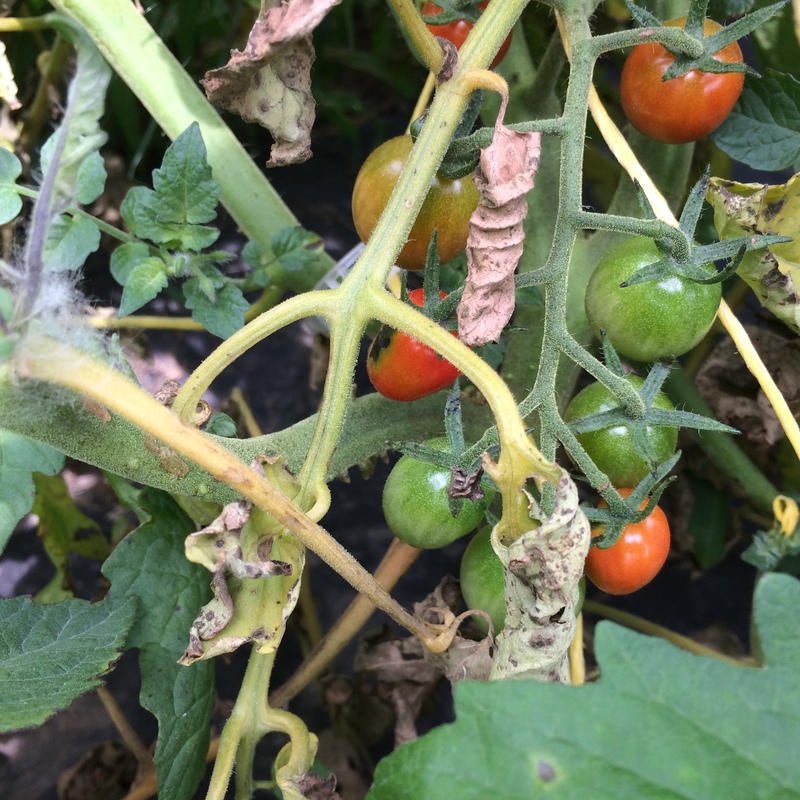 I have stopped pruning the tomatoes and that seems to be helping with the bacterial spot. This beautiful weather couldn’t have come at a better time because the spot seems to be slowing down just as the plants are starting to ripen. Two more weeks and it will be tomato time!!! This sunny weather with massive heat has also been very good to our peppers. 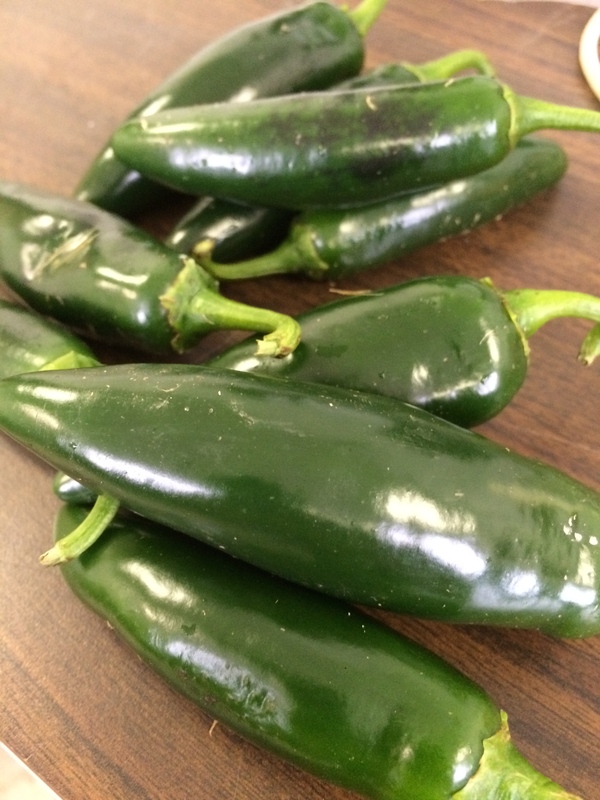 I got a small harvest of jalapeños and for the most part the plants have made a full recovery. They are now healthy and large. I think I need to stop freaking out and try to practice a little patience because they always seem to come out of their disease infested state with gusto. 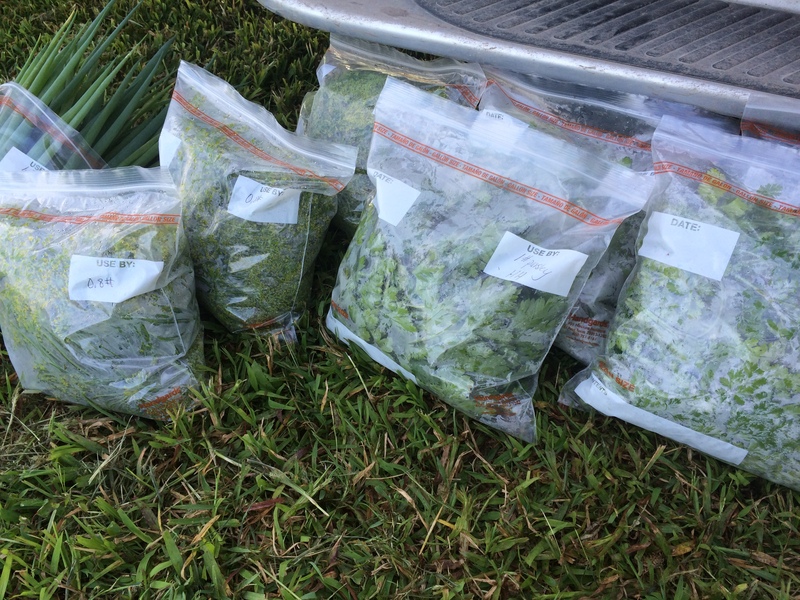 We had a beautiful harvest of fresh herbs. I am so glad I decided to put a small herb garden in the farm this year. They started slow but now are producing beautifully. It is also nice to say to the chefs “would you also like some dill for pickling squash??”. Speaking of which….. the squash pickles were phenomenal!!! They had the perfect amount of acidity with a bite, just like dill pickle spears. It was a fantastic way to use the large, excess squash. Sarah has been a planting machine getting our transplants seeded for fall, while I have been preparing the farm for a large SARE event that is to take place tomorrow evening (mowing, weed eating, trellising and fixing irrigation). 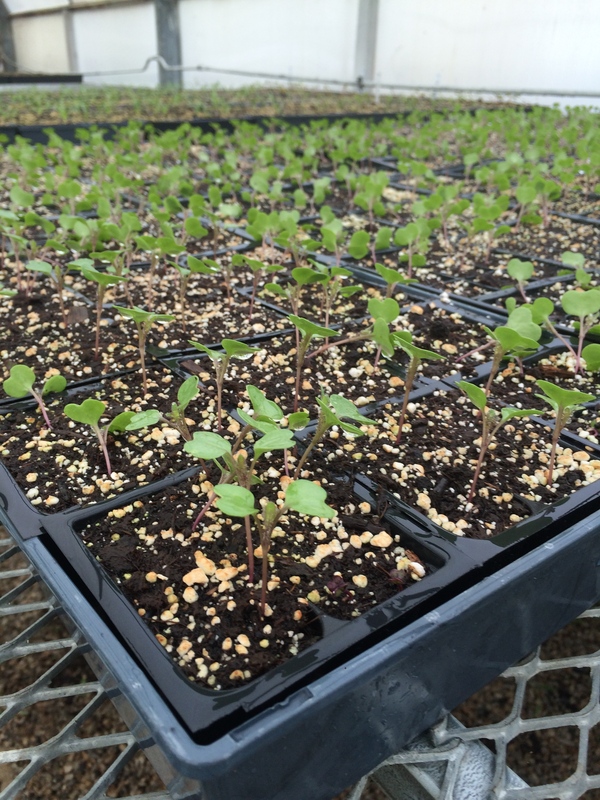 This is an exciting time for us because everything is now seeded and waiting to be transplanted in the field. We will have carrots, beets, parsnips, broccoli, onions, kale, chard, spinach and romaine. Such a good neighbor!! Thank you Thank you Erik!!! 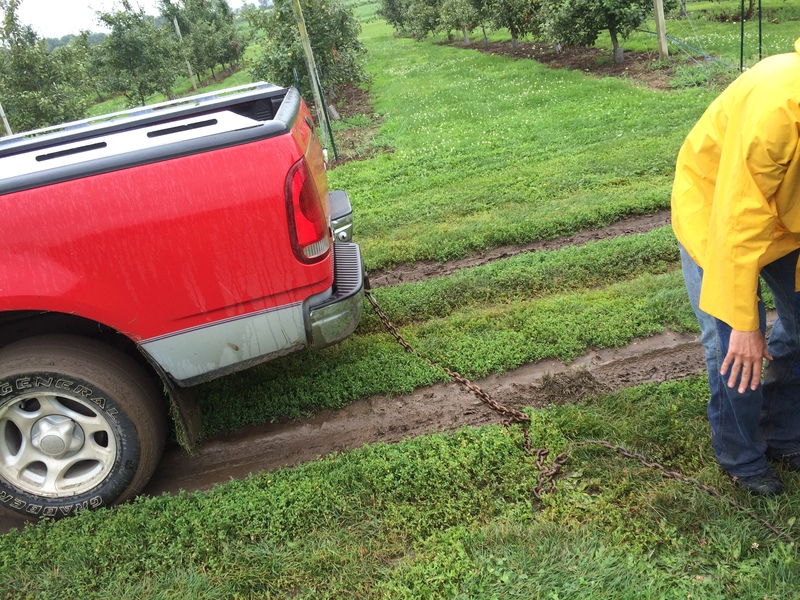 a little help from our incubator neighbor Erik who was kind enough to help us navigate the mud on his 4×4 mower. If you aren’t using a 4×4 for everything right now then you will not be getting anything done. 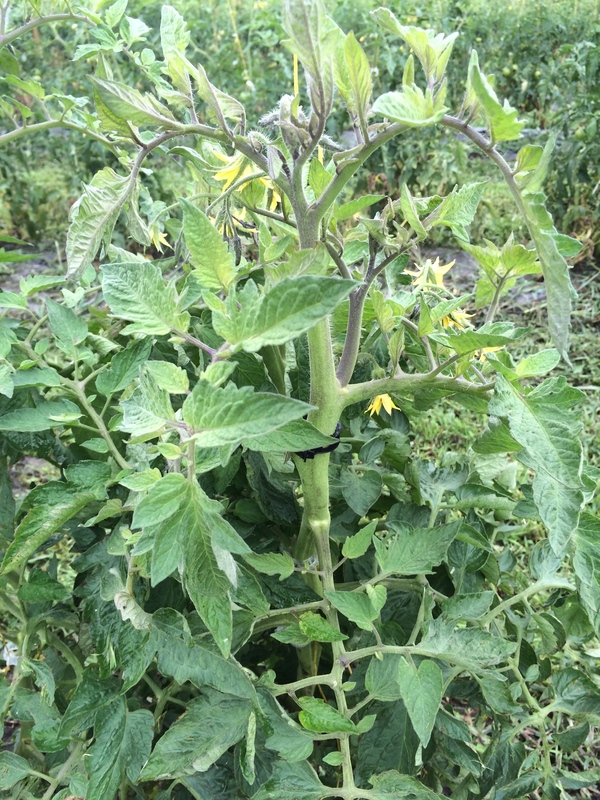 I was talking in last week’s blog about the rain wreaking havoc on our tomatoes. 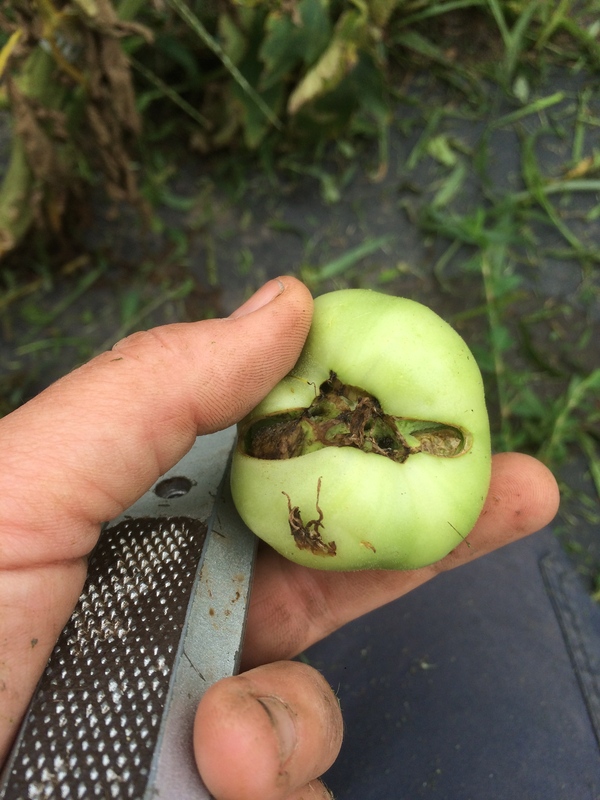 Besides the bacterial spot we also have blossom end rot, caused by too much water. The tops of the tomatoes don’t look too terrible so I remain hopeful we can pull out of it. I have a lot of transplants waiting to go in the field but the ground is too wet to till. I also can not fertilize because the ground is too saturated to take up any of the nutrients. ANNOYING!!! 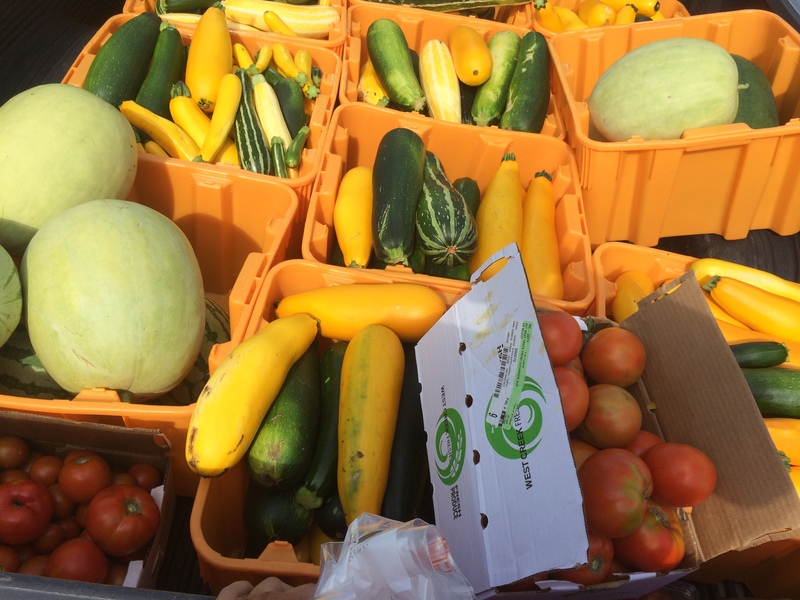 We had a beautiful harvest of squash last week with 300# going to Hendrick House, Killarney, the Food Truck and Newman hall. 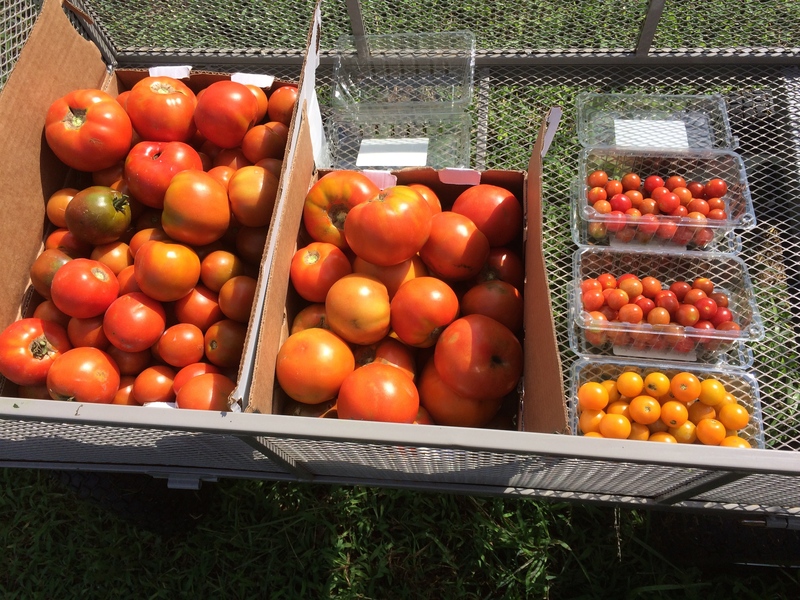 We had another 100# harvested today for Hendrick House for their local food event this coming Thursday. 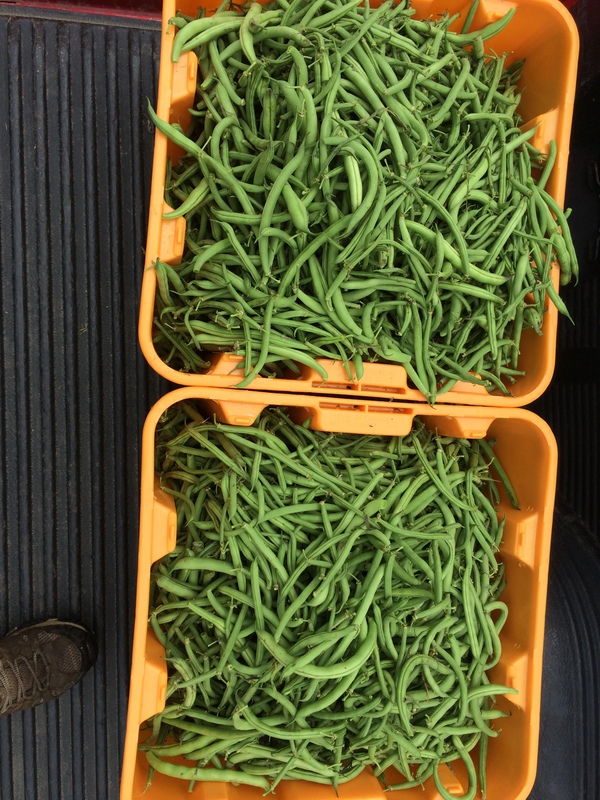 Green beans were finally ready and Sarah and I were able to pick 56# before the storm this morning. Those are headed to Hendrick House, also for the local food dinner. 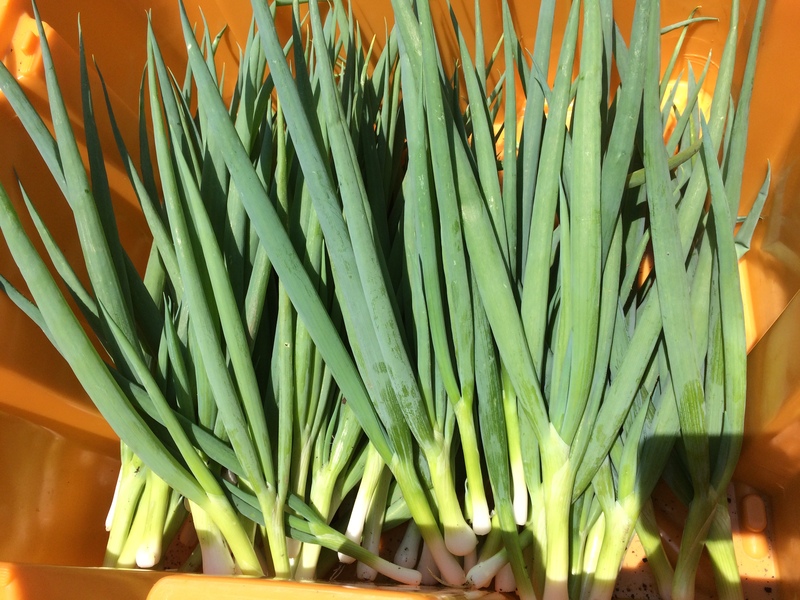 Our herbs are continuing to grow like crazy and we got a beautiful 4# of green onions harvested today. They smelled so good it was like an onion perfume that lingered for the rest of the day on my hands, clothes and truck. 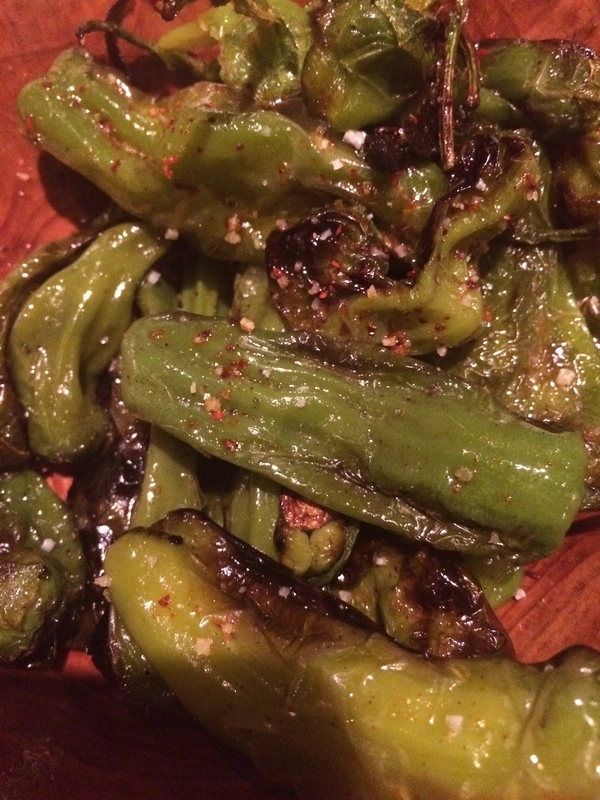 Soshito Peppers at HUSK! We are growing these this year!!! much a hands on visual learner so it was refreshing and amazing to see other farmer’s operations and also to visit restaurants whose chefs feature seasonal local produce. Despite there being a seasonal and soil difference between locations, this trip gave me a lot of ideas and also got me thinking about our little farm back in IL. At the end of the season last year my thought process was More Land = More Money = More Profit = Successful Business. (That is a lot of = signs. 🙂 ) I am now thinking that is not the case. I saw a lot of successful operations done very well on 1/2 the amount of land we have this year. I think that with a smaller amount of land, done right, someone can make just as much money. 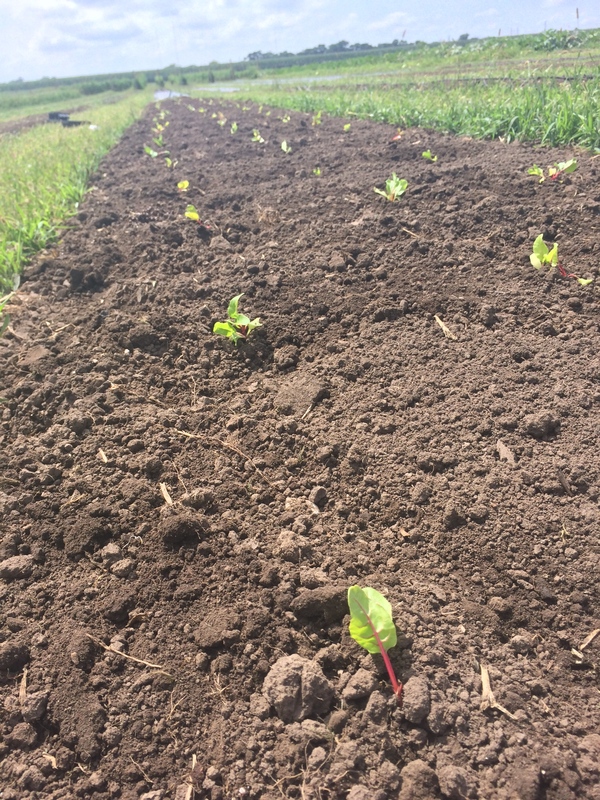 Right now, our 1.5 acres has some empty beds waiting for transplants to harden off. Some of that empty space is due to over growth of weeds taking over direct seeded beds. We are amending that with transplants that will go in the ground next week. However, I also think I could be better at succession planting and maximizing the space I have on a smaller scale. With all of these thoughts I also have to ask myself if the beds were all full would Hendrick House be able to use all of this produce during the summer when business is slow? My brain is racing with all of these questions and I am eager to find answers. We are now at the point in the season where we are thinking about students coming back in the fall, as I like to call it…. “go time”! 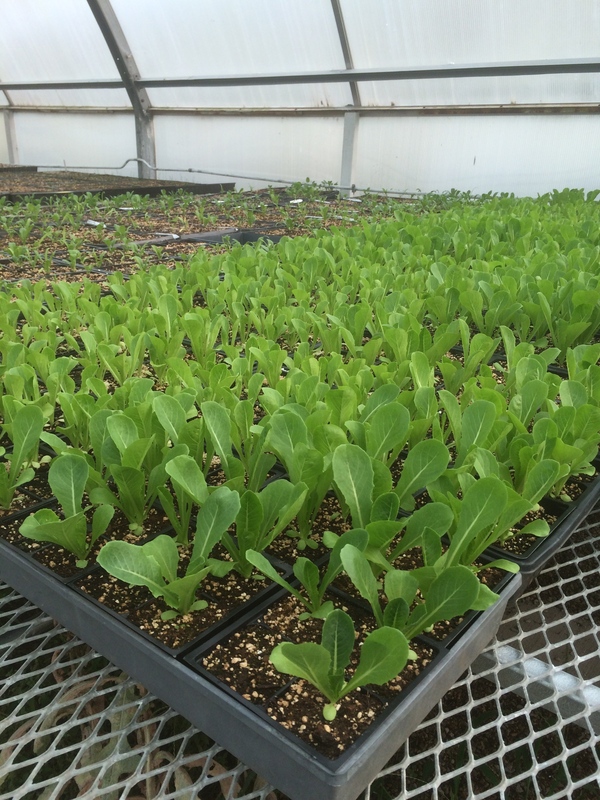 We have a greenhouse full of plants that are starting to be hardened off this week. Although weeding is a necessity, I much prefer planting and harvesting ESPECIALLY when I know the demand for this produce will increase. I do have to give a huge shoutout to Lance, Adam, Ryan, Chris and Ian! 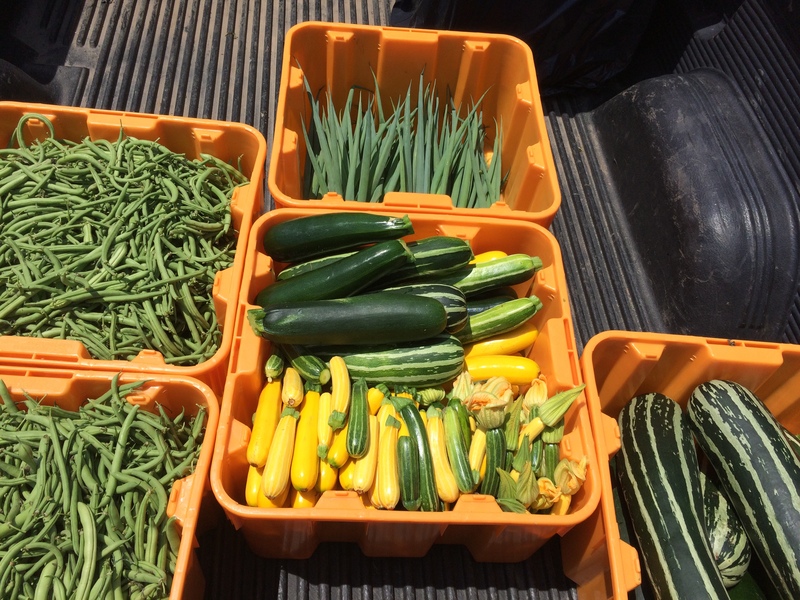 Even though we are in slower months they have never said no to me even when I asked them if they wanted to buy 300lbs of squash/ zucchini, which is a lot for anyone. I have said it before and I will say it again…. this project would not be possible without the chefs on the other end buying and creatively using the fresh farm produce!! 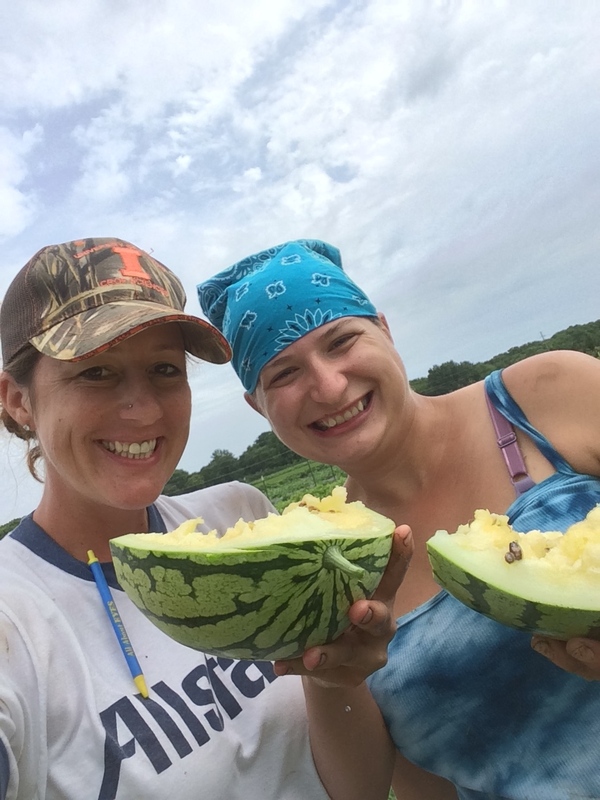 I also need to give a shout out to my farm assistant, Sarah. She did a fantastic job while I was gone and the farm looked great. My sincerest gratitude! 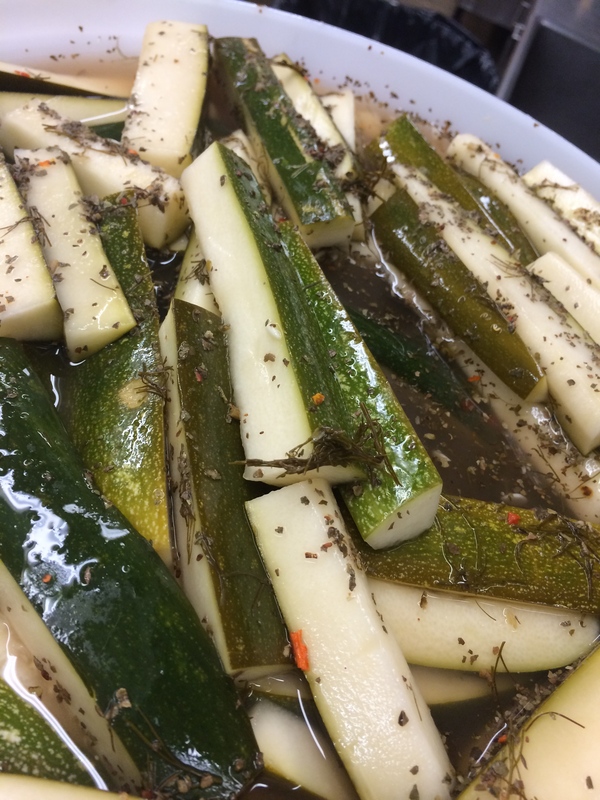 Because we have a plethora of squash right now I pitched the processing kitchen the idea of making squash/ zucchini pickles. They are similar to dill pickles and it seemed like a great way to not only use the excess of squash and dill from the farm but also to redistribute the product in the fall. Stay tuned and I will let you know how it works out. It could be the most disgusting thing on the planet but I have a feeling it won’t be 🙂 . By the grace of something we have watermelon!!! Must have been all those sleepless nights fretting about it and hoping my little/ gigantic mistake of not pollinating them would somehow go away. I didn’t even have to take a cue tip to collect pollen from another source, although I had them ready. This is seriously a freakish phenomena and I have 0 way to explain it, although grateful it worked in my favor. 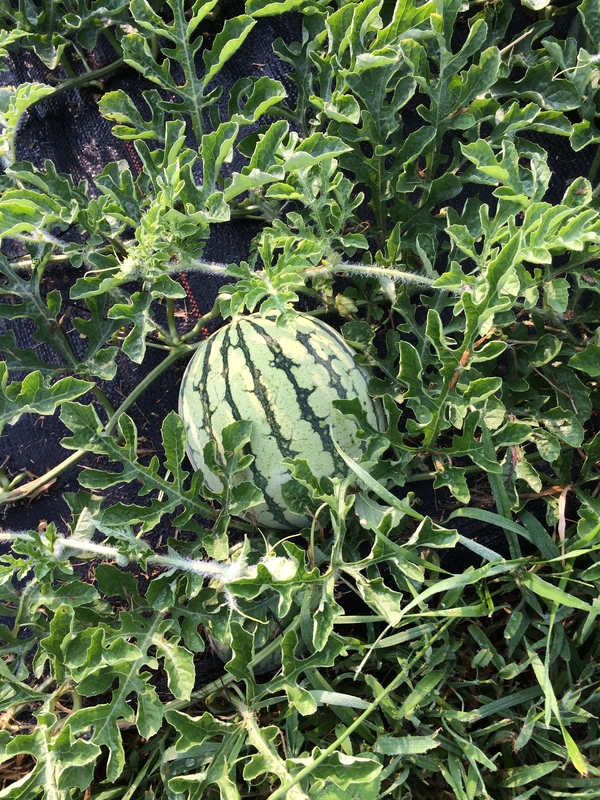 The watermelon are growing like crazy and we are predicted to have our first harvest in two weeks. I was finally able to hill the potato beds today. This is after waiting almost a month for the soil to dry out. They look good and healthy, although I did find an unwelcome invader on one of the plants. Hornworms are so huge it still gives me the creeps squishing them. 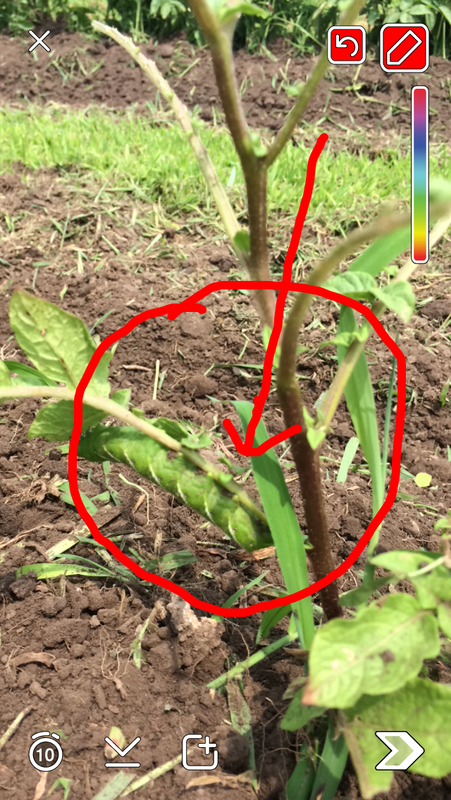 There was only one and I was grateful I haven’t seen any signs on the tomatoes yet. But where there’s one there are sure to be more. My eagle eye vision has been shifted into high gear. 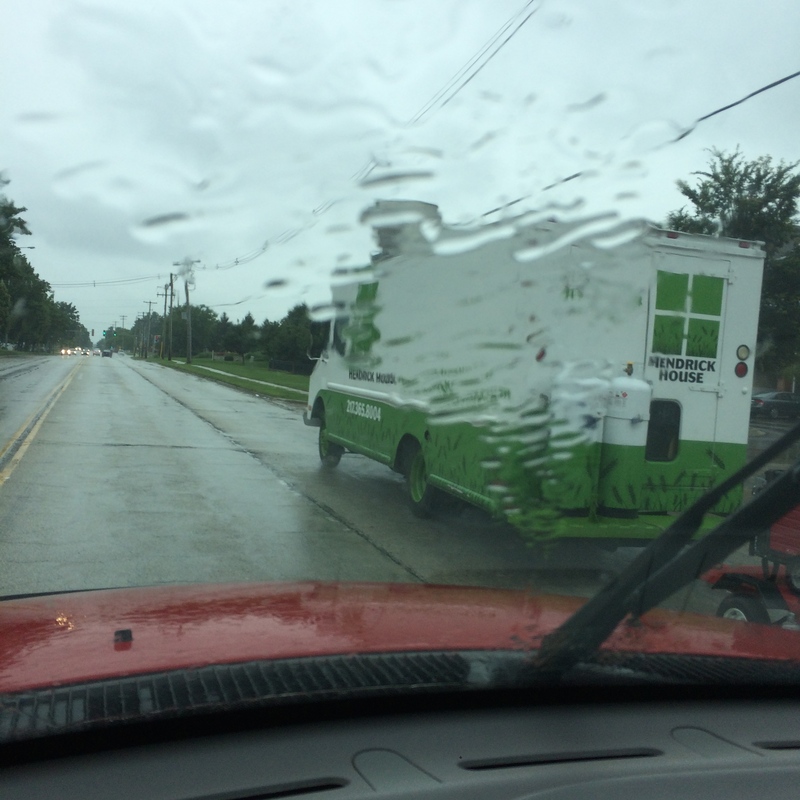 Using the compliment sandwich method and putting the bad news “sandwiched” with the good…. we have a serious bacterial spot problem. Because our tomatoes are fruiting I have started to see early signs on some of the fruit. We are fertilizing once a week and spraying copper, desperately trying to cure the problem. Jeremy says they look better this week compared to last but I secretly think he was just trying to make me feel better. I will be contacting Rick and hopefully he will have some amazing words of wisdom, like he usually does. 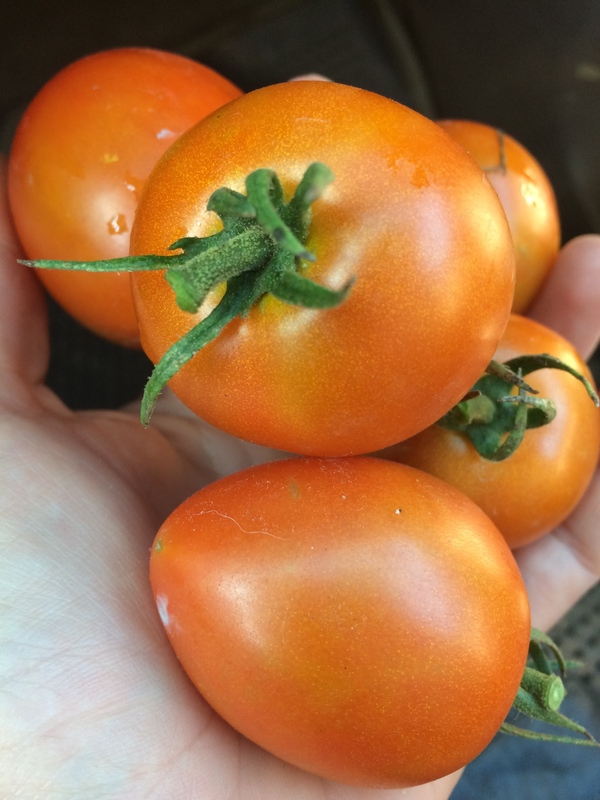 Speaking of tomatoes, I had a delicious lunch today consisting of 6 ripe cherry tomatoes! The first tomatoes of the season always gets me so excited for the fall. They were juicy and delicious with the perfect amount of acidity. It was a phenomenal welcome back present.